Railpictures.ca - Gord Taylor photo, Dan Dell'Unto coll. Photo: A drab winter’s day is brightened up by a pair of shiny new SD40-2′s, CP 5572 and 5574, working an westbound freight coming out of the west siding switch at Nissouri onto the Galt Sub, presumably after a meet with an eastbound. The white flags and class lights suggest this is an extra that would take the siding for higher class freights during meets, despite westbound being the superior direction. A cut of open autoracks full of new pickups and autos follow at the head end, and switch brooms stand at the ready in case the crew needs to sweep snow clear from the switchpoints. The Mile 104.9 marker plate on the signal suggests this is just east of Purple Hill Road., before the siding was extended westward at a later date (expanded from 6350 feet to 10150 feet, sometime in the 90′s or 00′s).At the time this photo was taken, CP was taking delivery of its first order of the new and improved “Dash Two” SD40-2 model, and the Dean & Hanna CPR book lists both 5572 and 5574 as outshopped from nearby GMD London and added to the roster on the same date: February 26th 1972 (the 6th and 7th SD40-2′s received). So even if this shot of both working together wasn’t their maiden run, it couldn’t have been taken too long after (the slide is dated March 1972). Ironically, both were retired at the same time (in September 2004) and sent via NRE to work in Brazil, becoming América Latina Logística 9457 and Ferrovia Centro Atlantico 4815 respectively. A warm retirement career and a long way from the frigid Ontario winters they started working in.Gord Taylor photo, Dan Dell’Unto collection slide | Railpictures.ca – Canadian Railway Photography – photographie ferroviaire Canadienne. Copyright Notice: This image ©Gord Taylor photo, Dan Dell'Unto coll. all rights reserved. Caption: A drab winter's day is brightened up by a pair of shiny new SD40-2's, CP 5572 and 5574, working an westbound freight coming out of the west siding switch at Nissouri onto the Galt Sub, presumably after a meet with an eastbound. The white flags and class lights suggest this is an extra that would take the siding for higher class freights during meets, despite westbound being the superior direction. A cut of open autoracks full of new pickups and autos follow at the head end, and switch brooms stand at the ready in case the crew needs to sweep snow clear from the switchpoints. The Mile 104.9 marker plate on the signal suggests this is just east of Purple Hill Road., before the siding was extended westward at a later date (expanded from 6350 feet to 10150 feet, sometime in the 90's or 00's). 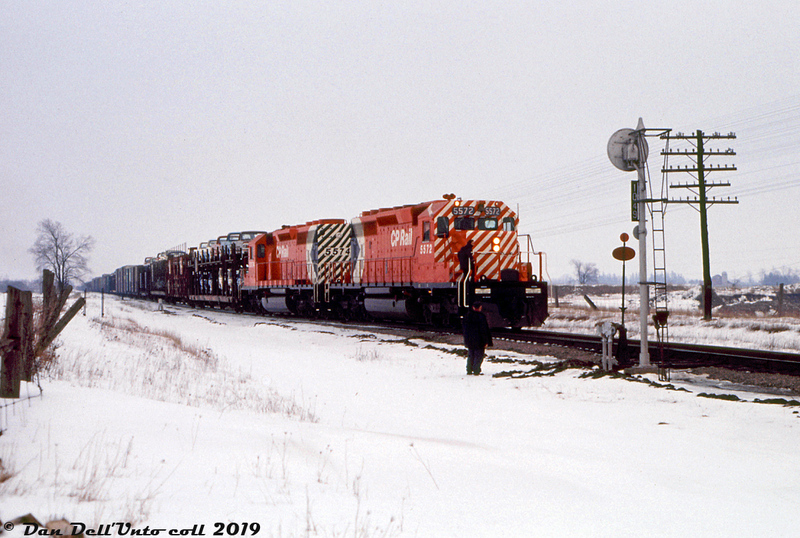 At the time this photo was taken, CP was taking delivery of its first order of the new and improved "Dash Two" SD40-2 model, and the Dean & Hanna CPR book lists both 5572 and 5574 as outshopped from nearby GMD London and added to the roster on the same date: February 26th 1972 (the 6th and 7th SD40-2's received). So even if this shot of both working together wasn't their maiden run, it couldn't have been taken too long after (the slide is dated March 1972). Ironically, both were retired at the same time (in September 2004) and sent via NRE to work in Brazil, becoming América Latina Logística 9457 and Ferrovia Centro Atlantico 4815 respectively. A warm retirement career and a long way from the frigid Ontario winters they started working in.